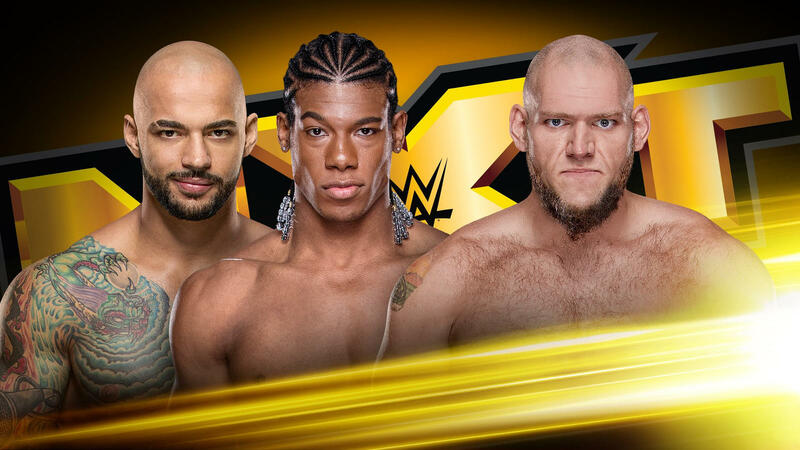 After quite truly ruining their match last week, Lars Sullivan will now face BOTH The One and Only Ricochet and The Velveteen Dream in a Handicap Match! Can this One and Only Experience topple the Leviathan? 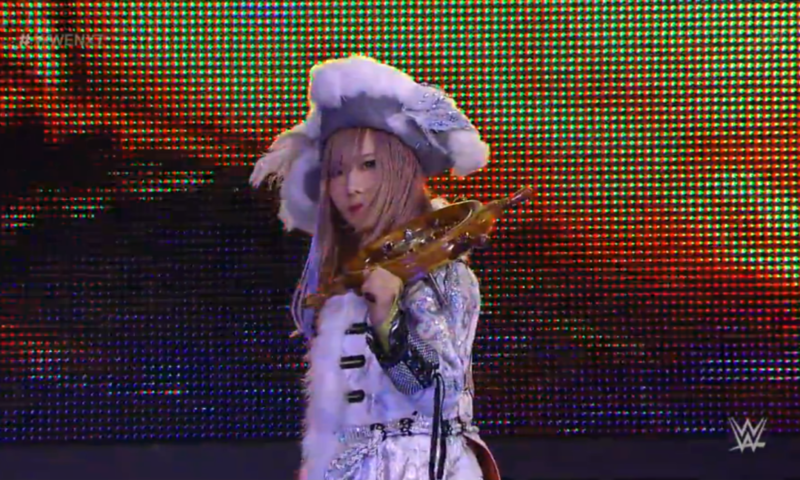 Plus, the Lady of NXT gets a rematch with the Pirate Princess in order to bring class to the Women’s Division. TM61 VS Heavy Machinery; TM61 wins. 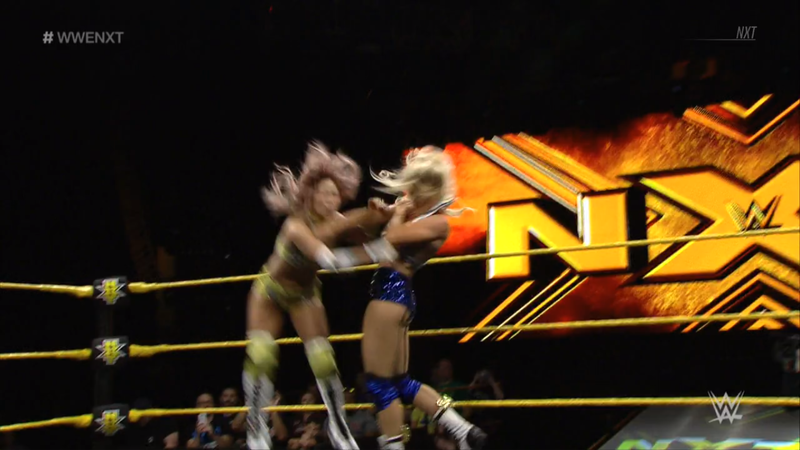 Kairi Sane VS Lacey Evans; Lacey wins. 2v1 Handicap Match: The Velveteen Dream & Ricochet VS Lars Sullivan; Lars wins. 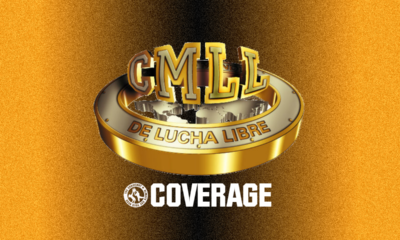 The Mighty Don’t Kneel, but everyone saw them cheat to beat the Street Profits a few weeks ago. Now Tucker Knight & Otis Dozovic want to see if Shane Thorne & Nick Miller can beat them fair and square. Will the Mighty be crushed under the #SteaksAndWeights? Otis starts with Thorne at the bell, and fans chant “Steaks and Weights!” Thorne dodges Otis to then slap him in the head, not taking “Dozer” seriously. Thorne tires it again but Otis grabs the arm to throw Thorne with it. Otis then runs over Thorne, and tags in “Tucky”. Otis & Tucker take three point stances, then double tackle Thorne. Tucker keeps on Thorne with a cover, ONE, but Thorne misses and ends up in a big atomic drop. Miller tags in but turns into a hip toss. Tucker runs and smashes Miller with a corner splash. Otis sees Thorne and intercepts with a pounce! Tucker sets Miller up in the corner, then helps Otis with Thorne. Thorne holds on but is carried away, for a battering ram Shattered Dreams! Heavy Machinery belly bump in celebration while fans applaud. Tucker swags around, then goes back to Miller. He puts Miller in another corner with a buckle bump, then back again. Tucker goes for a third, and it connects. Miller is dazed, so Tucker picks him up. Miller slips out but Tucker bucks him off. Tucker goes around but Thorne tags in and he rocks Tucker with a running European Uppercut. Thorne drags Tucker over and clubs away on him. He puts Tucker in the TM61 corner but fans rally. Thorne unleashes on Tucker, but Tucker hits back. Miller tags back in, and he gives hands to Tucker. Miller lets up at 4, then rams a knee into Tucker. Fans rally for “Tucky! Tucky!” but Miller keeps Tucker in the corner. Tag to Thorne, they double arm wrench and double shoulder into Tucker. Thorne gives kicks and knees, then tags Miller. Thorne brings Tucker up for Miller to punch. Tucker fights back but Miller knees low. Miller tags Thorne, but Tucker is too much to lift, so Miller feets Tucker to a rabbit forearm from Thorne! Fans keep rallying for Tucky, and Tucker is still too much to suplex, so Thorne hits a EuroUpper. Tag to Miller, and The Mighty work to suplex Tucker together. Tucker suplexes both TM61! Fans rally again, and Tucker crawls for his corner. TM61 are in his way, but he manages to hot tag to Otis! Dozer begins bulldozing TM61! Otis runs over Thorne, flattens Miller, then hits a spinning scoop slam. Otis fires up, and the fans rally with him, as he hits the Catepillar elbow! Cover, but Thorne breaks it up. Tucker returns to knock Thorne down with haymakers. Thorne tries to fight back but gets thrown with a double-trapped-arm belly2belly. Tucker runs in at Thorne, but misses and tumbles out of the ring. Miller goes after Otis, but Otis catches him into an exploder! Otis fires up again, and sees where Miller ended up. He climbs up, wipes himself with the TM61 towel, but Thorne kicks him down! Cover, with ropes and help, TM61 win! Another match, another win, but with another underhanded trick. The Mighty Don’t Kneel, but they do cheat. Will they cheat their way to the NXT Tag Team Championships? Exclusive interview with Biaca Belair. 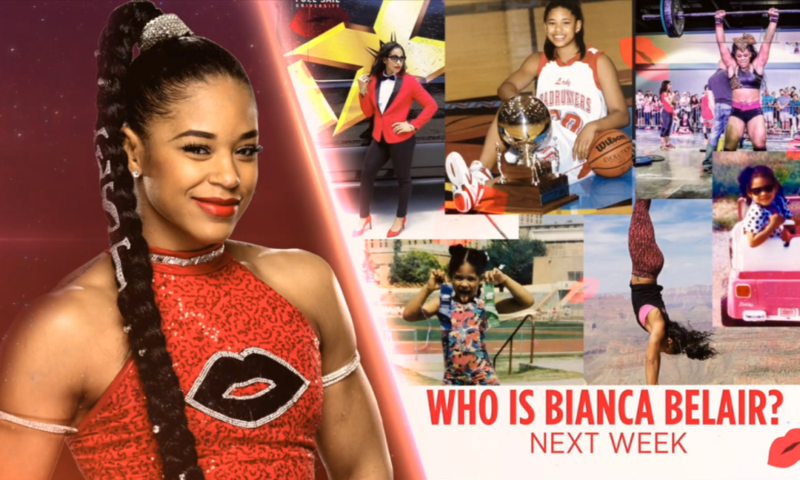 “Why is Bianca Belair the fastest rising star in NXT?” Why does Bianca have the brightest future? Do you even realize the significance of her roots? She’s the EST of NXT, and you’ll find out next week as the in-depth profile documentary continues. EC3 is the Top One Percent! 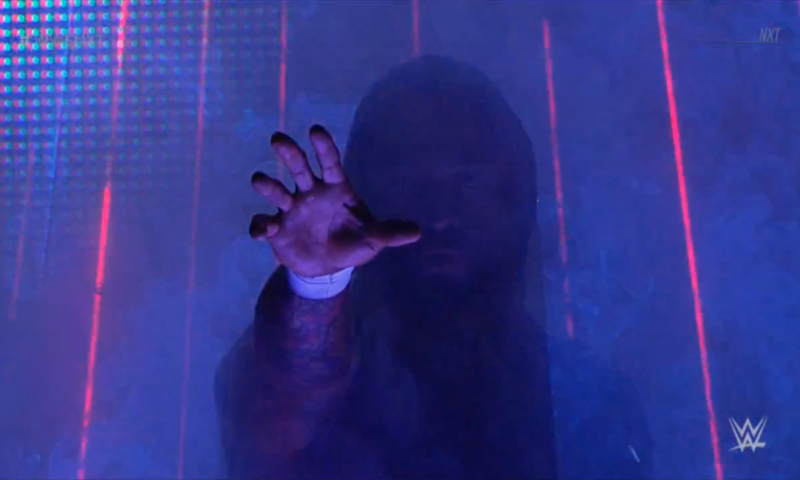 His third match, the triology, and his mindset is already taking over. NXT becomes NX3, fans will dance and sing as the transformation begins. EC3 is the best here, there or anywhere. This golden goose got it all done in three, so imagine when he has his fourth. Who will be the fourth man to face EC3 in this Top One Percent Era? Kairi Sane VS Lacey Evans! 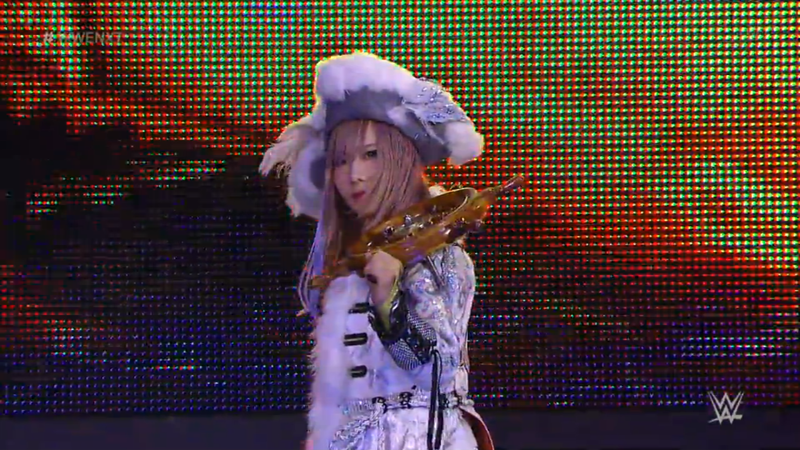 The Pirate Princess and the Lady of NXT have a rematch from their post-TakeOver encounter. The Model Soldier wants to straighten out and bring up the Women’s Division, but will she only be keelhauled by the Mae Young Classic winner? The bell rings and Kairi dropkicks Lacey right down! Kairi unloads forearms and elbows, but Lacey gets to the ropes. Lacey comes back and powers Kairi to ropes, and grabs Kairi’s jaw. She lets go at four but gives a SHARP chop to Kairi. Kairi rushes Lacey, go behind, and she grabs Lacey’s jaw to then chop her back. Kairi darse Lacey to bring it, then hits a tilt-o-whirl inverted DDT. Cover, TWO, but Kairi doesn’t let up. She wrenches an arm, then whips Lacey. Lacey reverses but misses in the corner, yet still catches Kairi with a mule kick. She then kicks out the arm, then covers, TWO. Lacey keeps on Kairi with a cobra clutch and some trash talk. Fans rally for Kairi while Kairi endures. Lacey thrashes Kairi but Kairi fights back. Lacey wrings her out for a roundhouse, then drops a knee right on the arm. Kairi gets to ropes but Lacey keeps on her. Lacey wrenches into a shoulder breaker, then kicks the arm. She brings Kairi up into a corner, and fires off forearms before pulling on the arm with the ropes. The referee counts and Lacey lets go at 4. Lacey stomps a mudhole into Kairi, then backs off to run in for the swinging bronco buster! She pushes Kairi out to then cover, TWO. Lacey grows frustrated with Kairi and goes after the arm again. She bends Kairi backwards across her knee. Kairi endures while fans rally again. Kairi fights out with knees to Lacey’s head. They stand up, Kairi blocks the kick into a takedown, then blockbuster! Kairi ax kicks Lacey’s back, then spears with the Interceptor! Lacey rolls to the ropes, but Kairi fires up. Kairi marches while Lacey gets to a corner. Kairi runs back in, Sliding D! Lacey is slumped over, then slumps out of the ring. Kairi goes to the apron for the Flying Kabuki! She puts Lacey back in the ring, then hurries up to the top. Lacey stands, and Kairi leaps, into the Woman’s Right! Down goes Kairi, and Lacey covers! Lacey wins!! 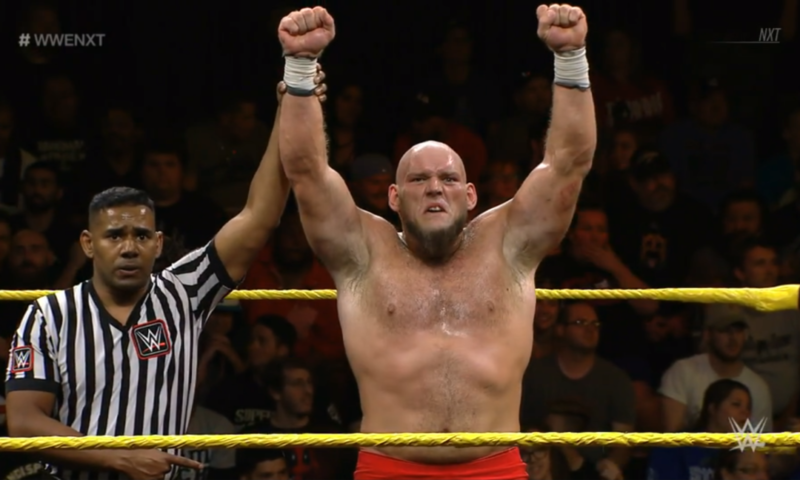 The Lady of NXT gets a major upset! She defeats the inaugural MYC winner fair and square, and out of nowhere. Armed with her Woman’s Right, will Lacey soon find herself atop this NXT Women’s Division? Backstage interview with Mr. & Mrs. Wrestling. The recovering Johnny Gargano and wife Candice LeRae are just now arriving to Full Sail. How is Gargano’s neck? “It’s seen better days.” But he and Candice discussed their future. They’ve come to a decision as a team, and they’re going to tell everyone in the NXT Universe. Gargano may not want to do this, but he has to. What is Gargano going to announce to the world?! 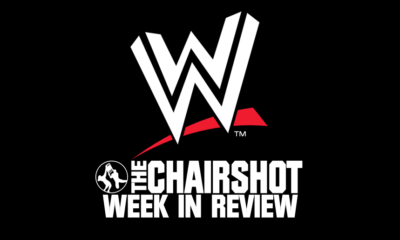 Exclusive interview with Lorcan & Burch after last week’s main event. 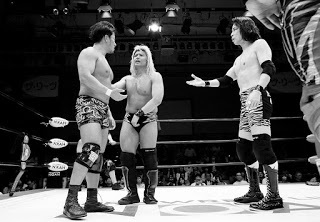 This one-two combination, along with Pete Dunne, defeated the Undisputed Era’s Adam Cole, Roderick Strong & Kyle O’Reilly in Six Man Tag action. 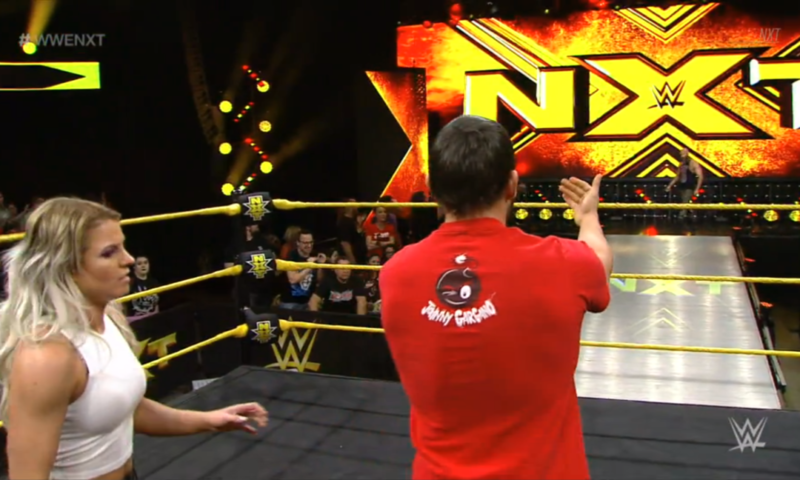 They specifically pinned one of the NXT Tag Team Champions, so they felt like they’re the #1 contenders! They beat them once, they can beat them twice, and be the new tag team champions. 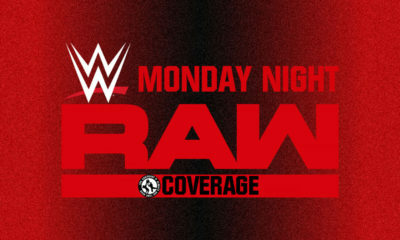 Will NXT GM William Regal agree with them? Adam Cole claims Lorcan, Burch & Dunne were the three luckiest men alive. Last week was a fluke, we all know it. But the funniest part is that those three will hang their hats on this win. Strong agrees, those three are NOT contenders. Those guys shouldn’t face the champions at Chicago. This is “Dune’s” fault for giving false hope to those other two. Who even are Lorcan & Burch? Bobby Fish agrees, he was watching and didn’t even recognize their opponents. But this is all settled in Chicago, and Strong can’t wait. Strong has little patience, so he wants wants “Mr. Number Two”, Danny Burch. Strong will prove that result was a fluke, and that Lorcan & Burch are out of their league. Is that #Undisputed fact going to be challenged next week? 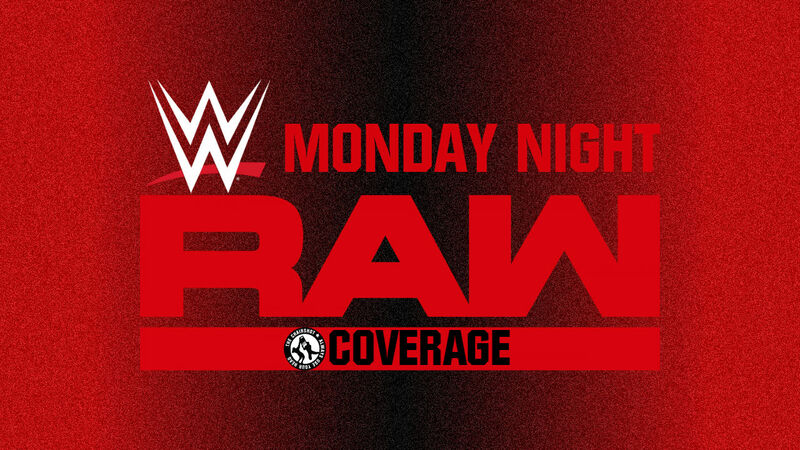 2v1 Handicap Match: The Velveteen Dream & Ricochet VS Lars Sullivan! 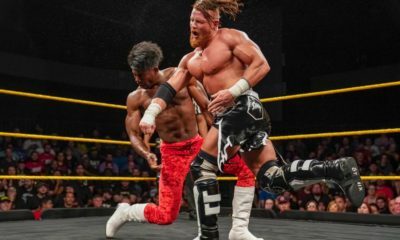 All three men want to be NXT Champion, but what was an unofficial contenders match last week between The One and Only and the Patrick Clark Experience was rudely and brutally interrupted by the Leviathan. Now, in order to remove the monstrous obstacle in their path, opponents become allies. Can Dream & Ricochet defeat Lars to then go back to fighting for a shot at Aleister Black? Lars can only face one man at a time, so Dream and Ricochet come to an agreement. Dream starts, and the bell rings. He circles with Lars as fans chant for him. Dream goes low but Lars is ready and he throws Dream to the corner. Lars flexes to show his monstrous muscles. Dream tags to Ricochet and fans chant for Ricochet as he ties up with Lars. Lars shows power again as he just throws Ricochet down. Dream has a talk with Ricochet and tags back in, and despite the rules, they both go after Lars with haymakers! They punch Lars back and forth, around and around, but Lars shoves them both. Dream & Ricochet come back with double dropkicks that back Lars up! Lars staggers, but dodges Ricochet. Dream anchors Lars’ legs, and Ricochet hits him with a springboard missile dropkick! Lars goes down, and Dream covers, ONE! Dream climbs up quickly, for flying ax handles. He climbs again, for more ax handles. Dream goes again, and hits a third. Lars still stands, so Ricochet tags in. Dream and Ricochet put Lars in a corner, then Ricochet runs corner to corner for the forearm. Dream runs in for a back elbow, then has Ricochet help whip him in for the corner splash. Ricochet adds a EuroUpper, then signals to Dream. Lars shoves Ricochet away, then catches him on the return. Ricochet punches out but Lars still tosses him to a corner. Lars catches the boot but that ax kick connects. Ricochet rolls and dropkicks Lars to the corner. Dream tags in but Lars fights back. Lars scoops Ricochet, but Dream saves him, and they go to double clothesline him. Lars breaks through the line, but misses his own clothesline. Ricochet mule kicks Lars, Dream adds the knee lift. Ricochet handsprings to hold Lars still, for Dream’s SUPERKICK! Then Ricochet somersaults and comes back, he and Dream combine for a boot and SUPERKICK combo! Lars goes down, they both cover him, TWO! Dream and Ricochet go for Lars but Lars clamps on Ricochet’s neck. Dream saves Ricochet and they both club away. They try to double suplex but Lars is too big and strong. They club some more, but Lars shoves Ricochet and clobbers Dream! Lars focuses on Dream and clotheslines him in the corner. Lars lifts Dream for an atomic toss. Dream writhes, Lars covers, TWO. Lars drags Dream up to rake and hook the face. Dream gets away to a corner, and Ricochet returns to their corner. Lars drags Dream up to shove him and forearm him in the back. He puts Dream in a corner for monster shoulders into the stomach. Lars glares at Ricochet, then drags Dream back up. Lars whips corner to corner hard, and Dream slump down. Cover, TWO, but Lars keeps on Dream with crossface forearms. Lars stalks Dream while Ricochet reaches out. Lars wrenches Dream in a powerful chinbar. 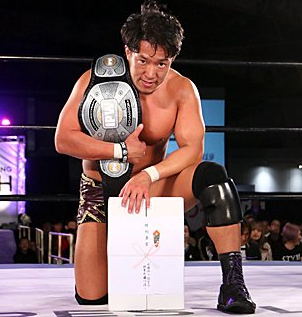 The fans rally for Dream, and Dream powers his way up. Lars knees low, then clubs him down hard. Lars taunts Dream to tag Ricochet. Dream crawls for his corner, but Lars holds him back by a leg. Lars reels Dream in, for a powerslam! Cover, TWO, and Ricochet is relieved. Ricochet and the fans rally, but Lars climbs up high. Lars leaps, and headbutts Dream’s back! Cover, but Ricochet breaks it! Lars is upset now. Ricochet dares him to bring it, and leads him on a cat ‘n’ mouse chase. They go around the way, back into the ring, but Lars catches Ricochet. Ricochet kicks Lars away, and sets him up for an elbow drop from Dream! Fans rally, hot tag to Ricochet! Ricochet rallies on Lars with forearms, then bobs and weaves with Lars. Ricochet fires off kicks to the knees, but Lars whips him into a corner. Lars runs in but hits buckles, then Ricochet hits the corner 619! Dream hops up, for a flying crossbody! Lars is down, Ricochet adds the standing shooting star. Cover, TWO! Ricochet keeps focus and fans are all fired up. Ricochet keeps on Lars with clubbing forearms. Dream tags in, swing kick, Ricochet boots Lars down. Ricochet tags in as Dream hops and springboards for a senton! Then Ricochet adds a springboard 450 splash! Neither man can cover from the impacts, and Lars rolls away. Dream betrays Ricochet with a rolling Death Valley!! Their alliance was going so well, but Dream shouts that Ricochet was trying to screw him over, so Dream did it first! Dream retreats as Lars returns, and Lars picks the bones of Ricochet, with a FREAK ACCIDENT! The Mile High Monster was gifted this win by The Dream, who wants the spotlight all to himself. But will letting Lars win mean Lars gets his shot against the Embodiment of the End first? And will the One and Only go after Dream for revenge in the coming weeks? Dakota Kai gets her chance at the NXT Women’s Championship! However, that means facing her fear of the NXT Women’s Champion, Shayna Baszler. The Queen of Spades has tormented Captain Kick ever since their first match in the ring, and enjoys the power she holds over Dakota. So is that what this is for Dakota? A dream come true? Part of her fairytale story? Nothing to say when she’s in front of you, Dakota? Dakota doesn’t stand a chance. But Dakota speaks up. “We’ll see about that.” Dakota leaves first this time, leaving Shayna a little surprised and perplexed. Will Dakota leave next week the champion? Or more broken than she was the last time Shayna got her hands on her? Mr. & Mrs. Wrestling head to the ring! Fans say “YES! YES!” Gargano knows the injuries are adding up, and the toll it takes on his friends, family and Candice, “Is it worth it?” Again, fans say “YES! 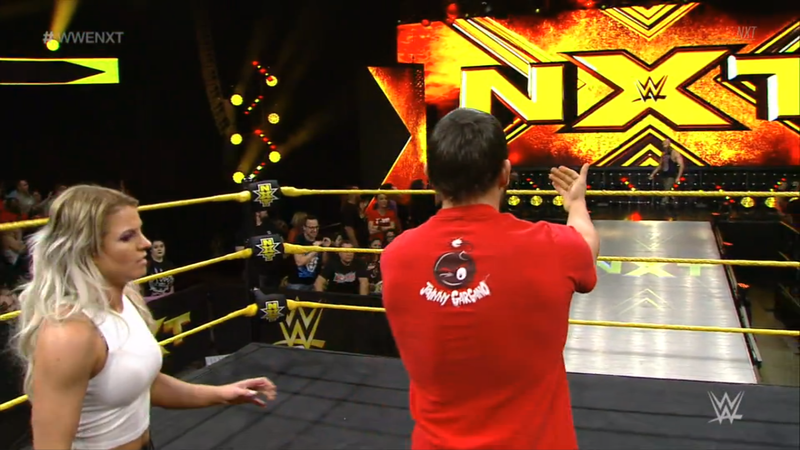 YES!” Candice and Gargano talk a little more as fans cheer for them. Gargano says, “Yeah, it’s worth it!” He takes the neck brace off and calls out Ciampa! Candice is afraid for Gargano, but Gargano wants to finish this! 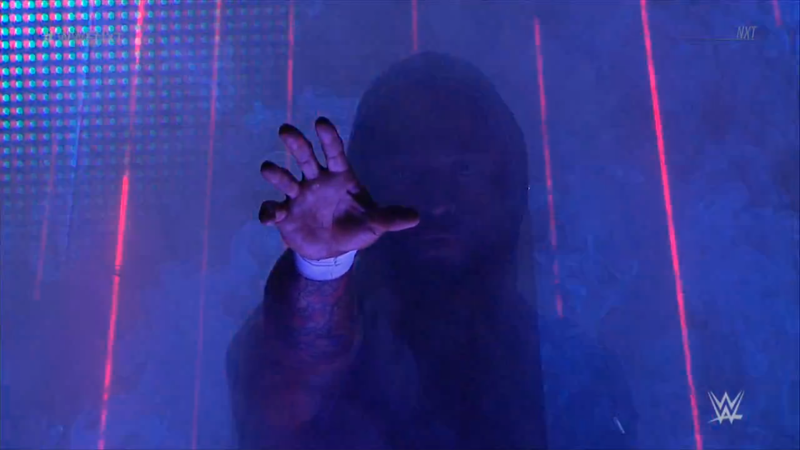 Speak of the devil, Ciampa appears. Candice hurries out as Ciampa tells the “boy” that Ciampa is going to go to the ring, and swears that if Gargano is still there, this WILL be finished. Gargano wants nothing better! Fans cheer Gargano on, but Candice returns with referees to keep them apart. That won’t stop them, as Gargano rolls out and goes around the corners. Ciampa hops into the ring while fans want to “Let Them Fight! Let Them Fight!” The referees keep Gargano back again but only Candice can stop Gargano. She reasons with him, but Ciampa taunts Gargano, “be a good little boy and listen to your wife.” Gargano won’t take that, and rushes the ring! But Ciampa knocks him back down, and Gargano falls on Candice! Both Mr. & Mrs. Wrestling crash onto the ramp, but she takes the worse of it. Ciampa realizes the mistake he’s made and gets out of the arena. Gargano stays with Candice while medics check on her. Gargano starts to panic, and wants more medical help for Candice. He said it was worth it before this, but is it worth it now? Another great episode, again reaching almost an hour, but it felt so fast somehow. 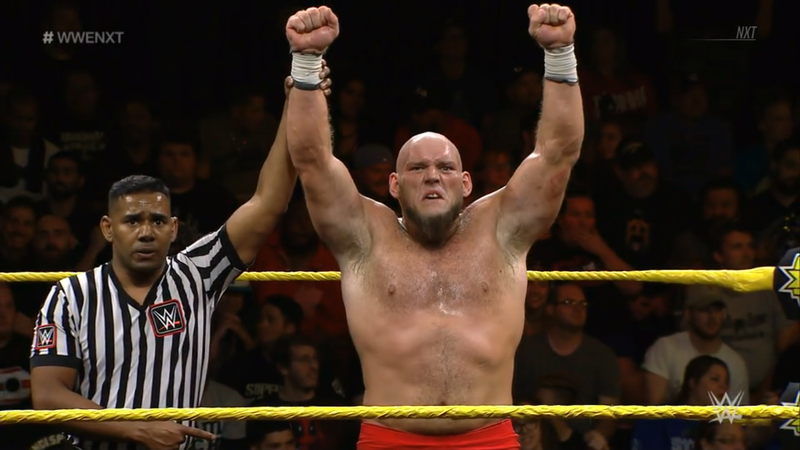 We go right into matches with TM61 VS Heavy Machinery, which was a pretty good match. This slow TM61 Heel turn is going well for them, because it’s at least getting them wins. But given Undisputed Era are the NXT Tag Team Champions, Heel TM61 will have to wait until Faces take those titles. Speaking of, while not official, I myself am expecting Lorcan & Burch VS Strong & O’Reilly for TakeOver: Chicago given last week’s results. The Undisputed Era gives a great promo in belittling Lorcan & Burch, and Strong VS Burch next week will be really fun. 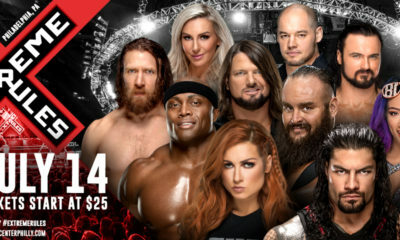 Though, I’m going to guess that Undisputed Era interfere as they usually do, and that will make the tag title match official. 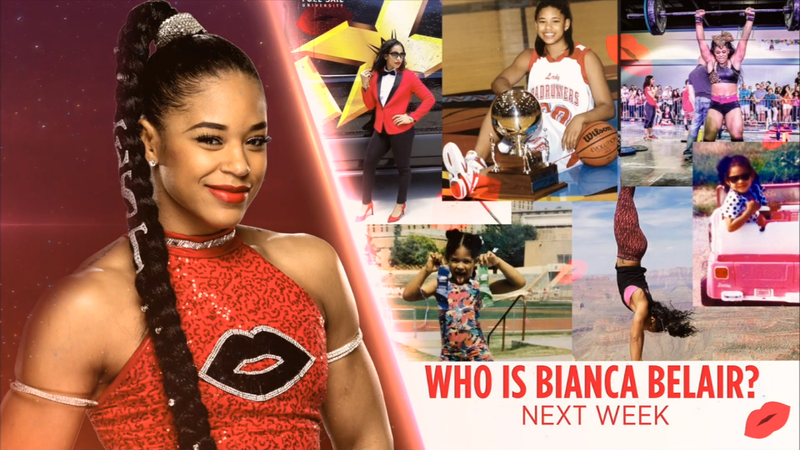 I’m intrigued by NXT giving Bianca Belair the kind of indepth look they gave superstars like Finn Balor, Roderick Strong and Ember Moon. She has been Heel so far in her NXT career, but given the right elements, she could be a welcomed Face. 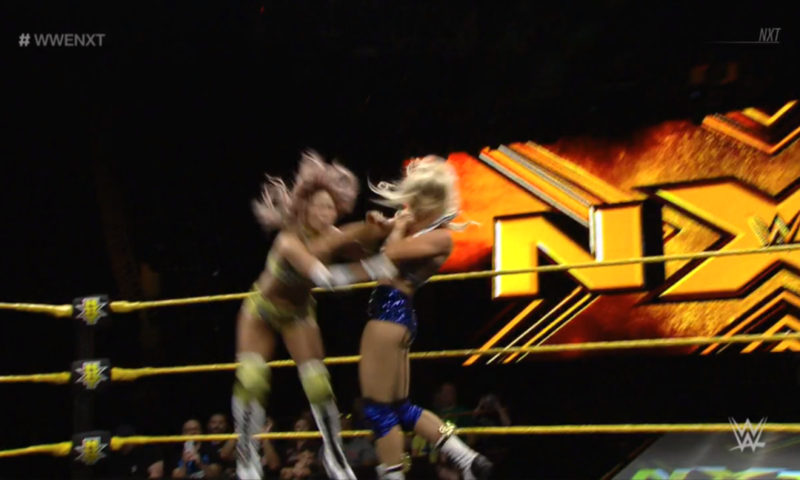 I was surprised to see Lacey win, and clean, but that ending is exactly how you book someone with a finisher like hers. This finish was an improvement over last week against Brandi Lauren, and can be the key to Lacey’s success as a Heel. Shayna VS Dakota happens sooner than I expected, but I still expect it to go down as Dakota snapping and going off, only to lose in the end. The way things are going, Nikki Cross is up next and might be the challenger that gives Shayna a real challenge. 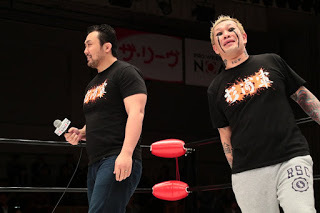 I knew Dream was going to betray Ricochet, but I thought it would be a more typical ditch at the corner deal. And at one point, I thought Dream was going to wait until he and Ricochet won. However, it fits his story better to do it before the finish, because if he isn’t in the spotlight alone, then he’d rather not be in it at all. This surely means Dream VS Ricochet truly happens at TakeOver: Chicago, while Lars and Aleister become each other’s most difficult opponent yet. The ending segment was a great parallel to Bryan’s retirement, but then Gargano swerves and ups the ante. I thought there was going to be a brawl, but that “accident” was a great twist. This ups the grudge even more, and Gargano VS Ciampa 2, likely at Chicago, will be an instant classic given how great the first was.